Skopelos ruined by "Mamma Mia!" Romantic idyll: Dominic Cooper and Amanda Seyfried embrace in the surf in a scene from the film - but are tourists ruining this unspoiled hideaway? 'Skopelos is about more than Mamma Mia! - we don't want our island to change because of a film,' says mayor Hristos Vasiloudis, who is sitting in his sunny office in a pink, short-sleeved shirt and jeans. 'The Greeks like to spend their evenings eating and drinking together, but since Mamma Mia! food prices have gone up by 50 per cent and the locals can no longer afford to eat out. One furious local, known for obvious reasons as 'Hairy George', has built a mock taverna in a lay-by to protest against rising bar prices. Development is booming, too. Property posters flutter in the wind around Skopelos, the island's first five-star hotel will be completed next summer, and building sites are being carved out of the empty land between the lemon trees and the olive groves as foreigners fight to buy a slice of the Skopelos dream. Prices start at about £120,000 for a traditional townhouse, and from £200,000 for a villa with sea views. According to local estate agents, interest has been increasing steadily since the film came out and properties are being snapped up within days of going on the market. 'There's no faffing about - they see something and buy it. They know that if they don't, someone else will,' says one estate agent. 'There's no such thing as a recession in Skopelos.' So what do the Skopelites think about all this interest in their beautiful green island? There are a few commercial types who think the mayor's mad not to milk Mamma Mia! for all it's worth. Generally, however, the locals aren't interested. Particularly outside Skopelos town, where eyes roll at the mention of the film. The locals do, however, have fond memories of the filming. As well as spending huge amounts of money on the island - 'It was like manna from heaven,' says local restaurateur Nikos Stamatakis - the cast and crew were happy to mix with the locals. They shopped in the gift shops, drank in the bars, danced on the tables and had a brilliant time. 'I had them all in here: Mrs Streep, Mr Colin Firth. Mr Brosnan was my favourite - so natural and handsome,' says Peggy, who runs a jewellery shop in Skopelos town. And many locals appeared as extras. 'It was so exciting and brilliant fun,' says Sabrina, a 38-year-old travel agent, who spent three days traipsing up and down the 202 steps to the chapel in the rain. There were, of course, a few hiccups. The set builders upset everyone by adding a false front to the chapel, and a vicar officiated in the wedding scene instead of a Greek Orthodox priest. But generally, the shoot went like clockwork and the locals have nothing but praise for the stars - particularly Brosnan, who did a lot of late-night drinking with them, charmed the whole island and wrote lovely thank you notes afterwards. To be fair, the film company did go to enormous lengths to put everything back as it was when they arrived. It seems the only thing they couldn't do was restore the peace and quiet. Goodness. As the story goes, the film's producers looked at more than 25 Greek islands before plumping for Skopelos. 'Apparently, they chose our island because it was so green and simple and peaceful,' says one local. Poor old Skopelos. It's still a beautiful island, but I wonder if the producers would choose it now? And if they did, whether they'd be welcomed with such open arms. Former ABBA stars reach settlement over script of "Kristina från Duvemåla"
— Former ABBA stars Björn Ulvaeus and Benny Andersson said Monday they have reached a settlement with a Swedish playwright in a copyright dispute over one of their musicals. In a joint statement, the two musicians and Carl-Johan Seth said they had requested the case be recalled from an appeals court that was supposed to hear it this week. Both sides had been feuding over who wrote the script for the musical "Kristina from Duvemåla", which has been seen by more than one million people in Sweden. Seth appealed a lower court ruling last year in favour of Andersson and Ulvaeus, who rejected Seth's claims that he was the main writer of the script. However, both sides agreed to drop the case after reaching a settlement that made it possible to "move on as friends," Monday's statement said. It did not give other details. Seth's lawyer, Staffan Michelson, said his client's reputation as a playwright has been "completely restored" and that the scheduled court hearing this Wednesday had been cancelled. The musical is based on novels by Swedish writer Wilhelm Moberg, which depict the journey by Swedish emigrants to the U.S. in 1850. ABBA, which also included singers Agnetha Faltskog and Anni-Frid Lyngstad, gained worldwide fame in the 1970s and early 1980s. What a great gift, possums! That's probably what Dame Edna would say if she was getting the same gift I got from my dear Greg and Pat in Australia. So what is this fantastic gift you may wonder? 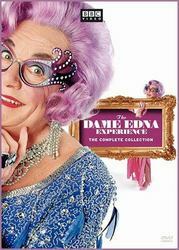 It's "The Dame Edna Experience - The Complete Collection". A fantastic 5 DVD box set. I remember watching these series religiously back in the 80's together with my roommate Ingrid Lee. We taped the shows and watched them millions of times. We instantly became Edna admirerers and we also had a very soft spot for poor little Madge, Edna's bridesmaid. Mel Gibson, Jane Fonda, Zsa Zsa Gabor, Cliff Richard, Ronald Reagan Jr, Grace Jones, Liza Minnelli, Dolph Lundgren, Vivienne Westwood, Chubby Checker, Dusty Springfield, Demis Roussos, Douglas Fairbanks Jr, Larry Hagman, Tony Curtis, Joan Rivers, Lauren Bacall, Jason Donovan (Kylie Minogue's boyfriend in "Neighbours") Charlton Heston, Gina Lollobrigidia and Rudolf Nureyev. That's what a I call a guest list! And I think now that this final compete series has been released on DVD we can once and for all kill the rumour that was going around in the eighties that Björn Ulvaeus from ABBA once guested the show together with Marie Fredriksson from Roxette fame. It just never happened. The DVD is so well put together, animated screens, hidden "tracks", a "forbidden" Madge-badge, but if you're naughty and press it anyway you get to hear Madge SING (I don't think you get to see her even talking the whole series through). The extra material is enormous. Several hours of old shows, TV-interviews together with Whoopi Goldberg and Dame Edna performing her disco hit "Disco Matilda" on Top Of The Pops! "Kenny claims that she's BI!" (Kenny is Dame Edna's favourite child, a gay designer). It is a very expensive box, but it has started to pop up on auction sites like eBay so I guess you will be able to get it for a good price. I whole heartedly recommend it to anyone who are in love with the very special comedy Dame Edna stands for. You can order the box at www.amazon.com!